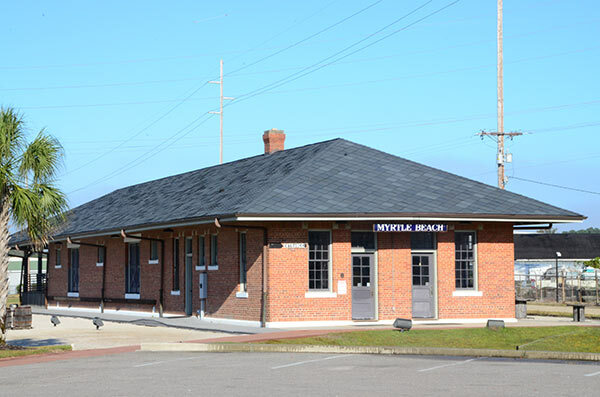 Opened for rail service in 1937, the Myrtle Beach Train Depot replaced earlier rail facilities that were erected nearby in 1900, when Myrtle Beach was established as a fledgling oceanside resort named New Town. Today, the old depot is a public facility operated by the City of Myrtle Beach for receptions, meetings and other public functions. On May 6, 1937, community leaders and officials of the Atlantic Coastline Railroad gathered at this site for a ribbon-cutting to officially open a new, brick, storm-resistant railroad depot for the small, but growing, oceanside resort of Myrtle Beach. 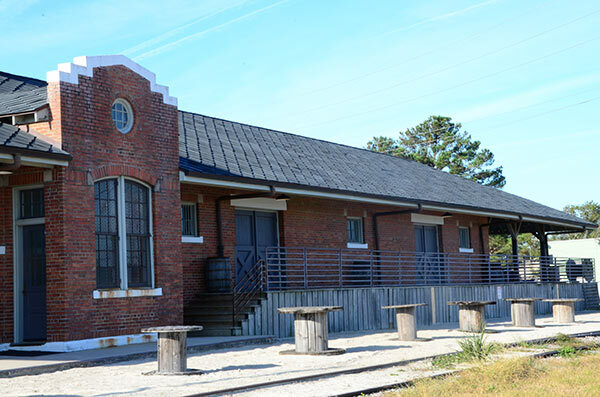 This brick structure replaced an outdated, wooden train depot, erected nearby by the Burroughs and Collins Company of Conway, which was instrumental in the founding of Myrtle Beach. In the late 19th century, vacationers from Conway and other parts of Horry County reached the beach along a circuitous route, usually traveling by steamboat downriver to a landing inland of the beach, then making the rest of the trip by wagon or buggy. In 1900, the first train from Conway reached New Town, as Myrtle Beach was first called. It was pulled by a second-hand logging locomotive called Black Maria, and the train cars had originally served New York City's elevated tram line. The railroad had been built from Conway toward the beach by the Burroughs and Collins Company, a local timber and mercantile firm, in order to harvest the timber east of Conway. As almost an afterthought, the company extended the line to the beach and developed a modest beach resort that consisted of a company-owned hotel, the Seaside Inn, a pavilion-style dance house, a bathhouse and a beachside boardwalk. The tiny, turn-of-the-century beach resort was the vision of the company's founder, Franklin G. Burroughs, a Confederate veteran and gifted businessman who had died in 1897. Before his death, he reportedly took a stroll on the empty beach and made a prediction: "I won't live to see it...," he observed, "but someday this whole strand will be a resort." New Town was soon renamed Myrtle Beach, in honor of the abundant native myrtle shrub, and the Burroughs and Collins Company which owned most of the property that would become Myrtle Beach, began selling beachfront lots - some priced as low as $25. Soon, a line of cottages flanked the pavilion, as the Conway, Coast and Western Railroad brought summer vacationers to the beach in growing numbers. Lodging at the Seaside Inn in the early days was $2 a day, including meals. Attired in ankle-length bathing suits made of mattress ticking, female beachgoers splashed in the surf with their husbands and boyfriends who usually swam in old clothes. After a dip in the Atlantic surf, vacationers could rinse off in the bathhouse under a shower rigger from a rain barrel. Following supper at Seaside Inn, visitors could take a romantic walk on the boardwalk, or dance to fiddle music in the pavilion. In 1912, the Burroughs and Collins Company partnered with a successful Chicago businessman, Simeon B. Chapin, and established Myrtle Beach Farms, a new firm that would guide the development of Myrtle Beach as a beach resort through the 20th century. Locomotives and passenger cars from Atlantic Coastline Railroad replaced the Black Maria, and eventually automobiles and airlines replaced the passenger trains. The Myrtle Beach area, eventually dubbed "the Grand Strand," developed slowly through the Great Depression and World War II, survived a devastating direct hit by Hurricane Hazel in 1954, then began a growth boom that would continue well into the 21st century. It all began with the Conway, Coast and Western Railroad that spanned the 14 miles from Conway to Myrtle Beach. Today, the site of the original Myrtle Beach boardwalk and pavilion is occupied by the modern Myrtle Beach Boardwalk and Promenade which extends along the beach for 1.2 miles, through the heart of what was New Town in 1900. Center to the Promenade, is the site of the historic Myrtle Beach Pavilion and Amusement Center which entertained generations of visitors to Myrtle Beach. The wooden beachside-dance pavilion erected near the Seaside Inn in the resort's early days was replaced over the decades by new structures including a two-story pavilion which burned. In 1947, a "hurricane-proof", concrete and steel Pavilion was constructed at the heart of what is now the Myrtle Beach Boardwalk and Promenade, featuring an upstairs dance hall, eateries, a bathhouse, and a popular arcade featuring mechanical and electric games. For modern generations of beachgoers, this popular, familiar beachside landmark was the Pavilion. A carnival-style amusement center, locally known as "the rides," was added later and eventually the entire complex became known as the Pavilion. The amusement center offered a wide variety of rides and attractions, including a double ferris wheel called "Big Eli", a 50-figurine carousel or "Merry-Go-Round", a roller coaster, a children's boat ride, an octopus ride, a haunted house, and an ornate 400-pipe band organ. In 1991, after a fatal accident, the ferris wheel was removed. In 2006, as amusement park aficionados demanded more elaborate thrills, the Burroughs and Chapin Company moved some of the amusement rides and attractions to the Pavilion Nostalgia Park and Carousel Park at Broadway at the Beach, and attempted to jointly develop a modern theme park on the outskirts of Myrtle Beach. Viewed as too small and outmoded to compete with modern theme park attractions, the Pavilion was razed. 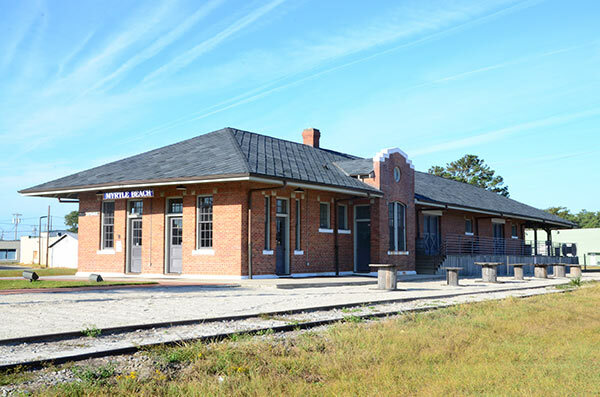 The nearby Myrtle Beach Train Depot is owned and operated by the City of Myrtle Beach. 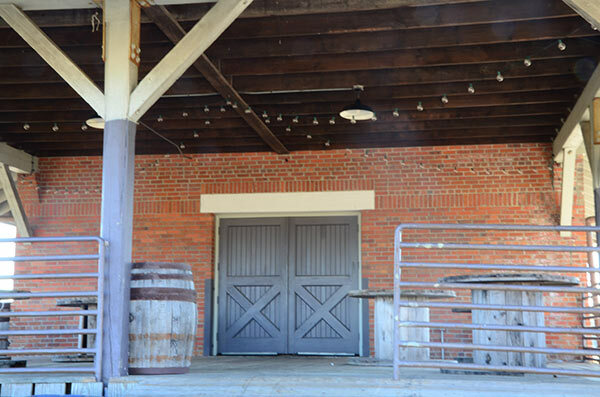 It no longer handles railroad traffic, but is available for use as a public facility for receptions, meetings and parties. The old depot features a restored great hall with exposed wooden trusses, plank flooring, brick walls and sliding freight doors. Listed in the National Register of Historic Places, it stands as a reminder of the early days when Myrtle Beach was a fledgling beach resort with a bright future ahead.